Lavender oil has more than 150 components that offer health benefits, acting to relieve symptoms of depression but also as an anti-inflammatory, antifungal, analgesic, sedative, detoxifying, antispasmodic, antimicrobial and hypotensive. Because of these effects, this oil may be helpful in reducing heart rate and anxiety in students who are on the eve of important tests. This effect has also proven effective through aromatherapy done with patients before undergoing surgeries, which is a time of great stress for most people. 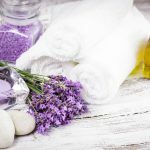 In this way, the use of lavender oil offers benefits to improve mood and reduce stress in work and study environments, as well as stimulates sleep and when the body is preparing to sleep. Several home remedies for insect bites are based on this oil. This is because it is so delicate that it can also be used on its own but, for convenience, you can only add one or two drops to a teaspoon of aloe vera gel, for an easy application on the skin. If you want to devote a bath or special care to your feet, you can use lavender essential oil, which will help relieve tension. Put 2 tablespoons of salt in the bowl and 2 drops of the essential oil; you can get 1 cup of coarse salt and 10 to 15 drops of oil for the water in the bath. With this oil, a baking soda base can be prepared for an organic deodorant, which will be applied to the skin with a powder sponge. Just mix 2 tablespoons of baking soda and 4 drops of lavender’s essential oil. Store in a pot and use it when needed, applying it to the skin as if it were a talcum powder. For an even more fragrant deodorant, you can add 2 drops of geranium essential oil. Tea is very good for people suffering from respiratory diseases because it has bronchodilator properties. It is recommended to consume it when you have colds, bronchitis attacks, asthma or any other respiratory disorder. This tea is also very tasty and beneficial to your health, so you should add it in your diet to improve your health and combat various diseases. Another spectacular benefit of lavender’s tea is that it helps to relieve fever, especially when the body is fighting against viruses or bacteria.